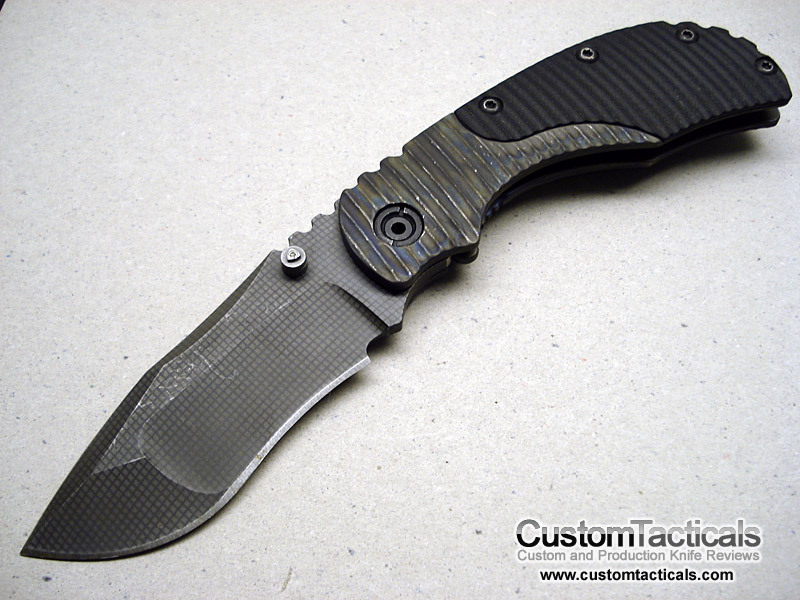 The Dwayne Dwyer and Mick Strider custom folders cost a hefty premium from the standard line of offerings from Strider, and with them you get all sorts of fancy options like Nightmare Grinds, and of course the full size RC folder is only available in a custom edition, unless you have one of the early first run RC’s. The RC folder is 4″ in length, which is longer than the RCC at 3.5″. The RC balances extremely well, even though it is probably one of the heaviest folders that Strider makes. The integral bolsters give the folder a nice mid-point balance, and it balances just behind the finger choil. 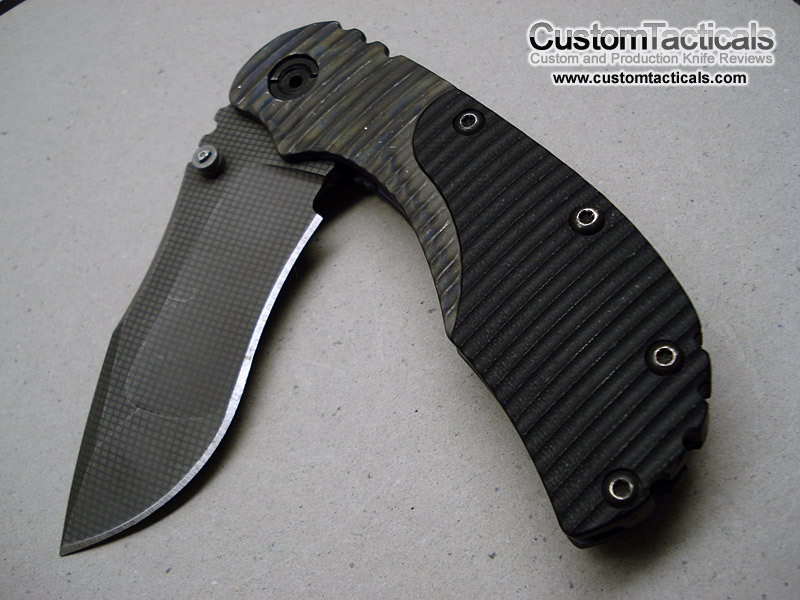 Finish is typical Strider, with bead-blasted, heat colored Titanium scales and pocket clip, with bead blasted G-10 scales and grid-patterned nightmare-ground blade, which is also.. bead blasted. Tritium thumbstuds which makes the knife a bit easier to spot at night, though the tritium vials are pretty small. The knife is very large, however, so if you do not want a big folder taking up your pocket space, this is not for you. The Nightmare grind on this guy is sweet. It is a nightmare recurve, so it lacks the dramatic hook that some of the NMG’s have, but the thinner deep hollow ground center makes the knife great for shaving wood or even peeling potatoes, while leaving a slightly shallower hollow grind on the tip to give it a bit more strength. 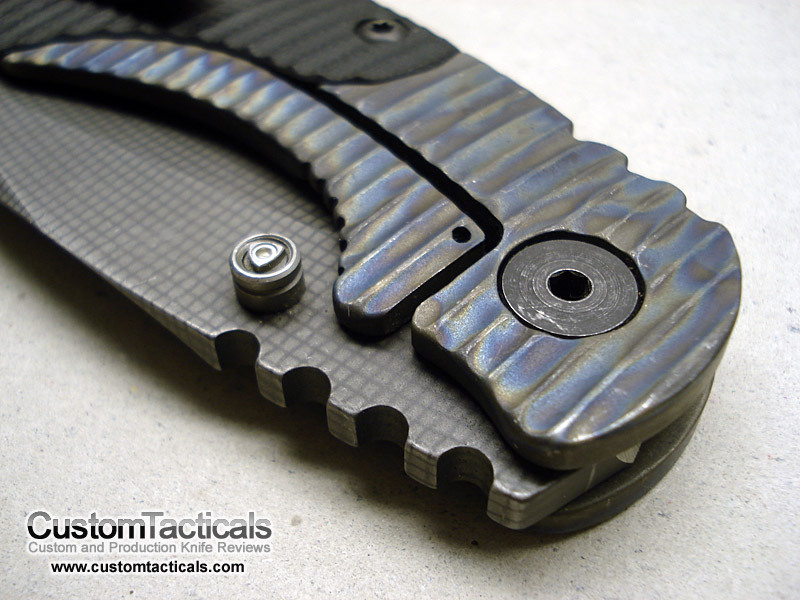 This MSC RC features a full heat-colored titanium backspacer which also contributes to the weight of the peice, as most of Striders folders use standoffs or have integrated G-10 backspacers like the SnG and SmF. Also, since this design has the integral bolsters, the handle slabs inherently act as lock bar stabilizer for the framelock mechanism. Overall this is one amazing knife, and I don’t think there is a knife out there that I would rather carry with me if I could only have one. Aside from it’s obviously large size, there are no drawbacks to carrying this knife that I can tell for me. I really appreciate the build quality of this knife also, as it is definately a step above the standard edition Striders. i am looking to purchase this knife in your review, where do i go and how do i go about it, strider msc rc frame lock folder, thank you. i spoke with one of your employees about the msc rc framelock folder and was texted another email address for info that never came through, please contact me at 215-768-2409 or email me back, i am looking to order the knife next week with one change, if thats possible, i would like the blade to be heat treated(like the backspacer), instead of the grid pattern, but every other detail the same, thanks again. Hi George, I think you have the wrong site. I do not sell the Strider knives, I just review them. Did you purchase from Strider directly or from a dealer? Hey, I read in your FAQ section (excellent resource by the way) about stellite that it is basically obsolete because it’s so soft and expensive. Do you have any idea why some guys, particularly Mick Strider and Tom Mayo, still use it? Is it just a gimmick? The only reason I could think of is maybe it’s non-magnetic like the titanium and CF blades Warren Thomas uses. I would really appreciate your thoughts on this matter. Also I’d be interested to know what you think about those laminate blades Warren Thomas makes, for instance are they harder than stellite? Thank you. This is the best place I could find to post this question. Hi Chris, Its not obsolete, its still a fantastic blade material that lasts a long time for cutting soft stuff. The problem is that its expensive to buy, and expensive and hard to grind. It doesn’t take as sharp an edge and is quite soft, something around 47 HRC, so not good for hard cuts as it will bend the edge.